Electromagnetic rays emitted by cell phones may sound the death knell for the honeybee which has been found to have altered its behaviour leading to the complete collapse of bee colonies, says a new study. Already suffering from the colony collapse disorder (CCD) where whole colonies of bees collapsed due to various causes like the use of genetically modified crops, electromagnetic rays emitted by cell phones has now added to the woes of the honeybees. The CCD was previously attributed to viruses, parasitic mites, pesticides, genetically modified crop use and climate change. Published in the latest issue of the Current Science journal, the study conducted by researchers Ved Parkash Sharmal and Neelima R Kumar from Panjab University have found changes in honeybee behaviour and biology under the influence of cell phone radiations. The new study has come close on the heels of an experiment conducted in Kerala by Sainuddin Pattazhy who found that the electromagnetic waves emitted by cell phone towers crippled the "navigational skills" of the worker bees that go out to collect nectar from flowers to sustain bee colonies. The researchers from Punjab University reached a similar conclusion after comparing the performance of honeybees in colonies exposed to cell phone radiation and those in colonies which remained unexposed. "Increase in the usage of electronic gadgets has led to electro-pollution of the environment. Honeybee behaviour and biology has been affected by electrosmog since these insects have magnetite (a natural magnet) in their bodies which helps them in navigation," the researchers said. 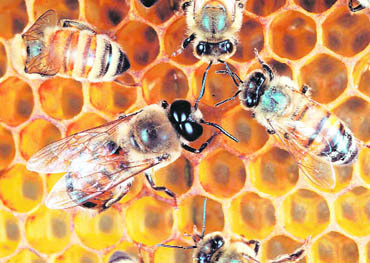 The researchers selected four colonies of honeybees, Apis mellifera L, from the apiary of Panjab University’s Zoology Department. "Two colonies marked as test colonies were provided with two functional cell phones of GSM 900 MHz frequency. The average radio-frequency (RF) power density was 8.549 `B5W/cm2. The cell phones were placed on the two side walls of the bee hive in call mode," says the study. The other two colonies remained unexposed to cell phones. A significant decline in colony strength and in the egg laying rate of the queen was observed in the exposed colonies. The study says, "The behaviour of exposed foragers was negatively influenced by the exposure, there was neither honey nor pollen in the colony at the end of the experiment." The exposure given was 15 minutes, twice a day during the period of peak bee activity for twice a week extending over February to April last year and covering two brood cycles. It was observed that the total bee strength was significantly higher in the control colony being nine comb frames as compared to only five in the treated colony at the end of the experiment, as per study which noted that the queen exposed to cell phone radiations produced fewer eggs per day (144.8 eggs) compared to the control (376.2 eggs). Although the scientists did not find immediate exodus of bees as a result of this interference, the insects became quiet and still or confused as if unable to decide what to do, affecting their honey-storing ability.